Here are my selected sources for free baby dolphin photos. Enjoy! And take a look at the dolphin posters & photos album and at the other dolphin resources below. The alamy website contain tens of baby dolphin photos which you can download, part of them royalty free (I think the royalty free photos are free to download if you agree to their license, but I haven't checked it out). 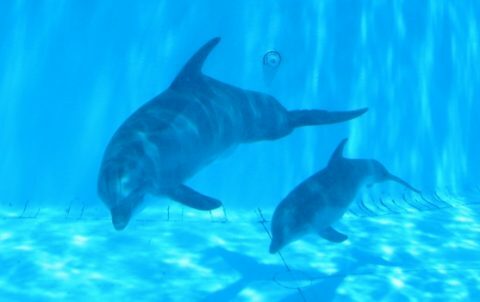 A nice video, from the National Geographic website, shows how a baby dolphin learns the secrets of survival. Wild Dolphins are one of the most beautiful animals on the ocean. Those mammals are great teachers, teaching us to regain our playfullness and joy. That's why people love dolphin gifts so much. There are many dolphin photos, but good photos are quite rare. The most beautiful pics are those made in nature, underwater, with an inspirational quality of light. You need a professional underwater photographer which with a lot patience and experience in order to make them. Baby dolphin photos are especially rare - here are the best photos and posters I've found. Take a look at hitech-dolphins recommended sources of great dolphin posters, exiting dolphin information, free dolphin screen savers, amazing dolphin art and beautiful dolphin clip art and cartoons.